I am not sure what news could overtake the bittersweet emotions of the Angels losing three out of four to the Rangers, moving to seven games out of first place, and trading 8-year Angel veteran Joe Saunders while getting a great pitcher (and hometown hero?) Dan Haren from the Arizona Diamondbacks. Haren went to Bishop Amat High School and owns a home in West Covina, so in a way, he heads home by being traded to the Angels and can become something of a hometown favorite with them. And in a similar twist of fate, Saunders is traded to Arizona where he owns a home in Phoenix. If that is solace to Saunders who fell just short of tears when speaking to reporters is unknown. – For 80 years the El Calvario Community Center in El Monte provided classes, daycare and tutoring to neighborhood children and teens. But when the center closed down nearly three years ago, it began providing quite the opposite – a hideaway for methamphetamine users. – Baldwin Park will reconsider its vehicle impound policy after the Police Department took a woman’s car for 15 days – even though she was in the passenger seat and willing to drive her car away from a police checkpoint. – Majestic Realty Co. CEO and chairman Ed Roski Jr. said he remains committed to returning professional football to the region and building a state-of-the-art NFL stadium near the junction of the 60 and 57 freeways. – Anyone who has an opinion about a Navy proposal to clean up most of the contamination it left near Morris Dam during torpedo tests has one last chance to share it with government officials. – Duarte is going to take legal action against Azusa over a recently approved plan to mine part of the Azusa Rock Quarry near Duarte’s border. As for the week ahead, special council meeting in Azusa tonight at 6:30 pm. at the Azusa Light and Water Conference Room, 729 N. Azusa Ave., will discuss purchasing a new police vehicle and a new contract with the Azusa Chamber of Commerce. Glendora’s council meeting at 7 p.m. on Tuesday at City Hall, 116 E. Foothill Blvd., will look at, among other items, fees for city services. Also Tuesday, San Dimas City Council will consider a request for the Five Cities 10K run on Nov. 6. For those of you familiar with the ongoing issue of the Azusa Rock Quarry, the plan from Vulcan Materials Co., and the battle between Azusa and Duarte, you are familiar with Vulcan spokesman Todd Priest, who is with the public relations firm Curt Pringle and Associates. Well … I learned today that while Priest and his crew will remain as part of the team working for Vulcan, a new spokeswoman has taken over as the voice of the company from here on out. Peg Casey, an employee with Vulcan, will be the one answering questions through the litigation process. I spoke with Casey today following up on Duarte’s decision to pursue litigation. She has worked with Vulcan for 16 years and has been involved with the Azusa Rock Quarry project since 2003. Here what she had to say and more about the impending lawsuit in tomorrow’s newspaper. Just when you thought it was over there is breaking news the Duarte City Council has unanimously decided to pursue litigation against Vulcan and Azusa over the recently approved Azusa Rock Quarry mining project. OK, you didn’t really think it was over did you? This is really only breaking news because it happened last night at a closed session council meeting. In truth, this probably surprises no one. Not me, not Duarte (the vote was unanimous), not Azusa, and not Vulcan. Azusa has said all along they anticipated litigation, Vulcan and Azusa agreed in the development agreement that Vulcan would pay to fight any legal challenge, and Duarte has that $700,000 Fight Against Vulcan Expansion fund. Plus, when Duarte, Vulcan and Azusa failed to reach a settlement deal earlier this year, if the project was approved what other outcome was there? Now we will get to see what Duarte’s legal arguments will be. My guess is they will argue about the flaws in the environmental impact report, their believed contradictions in the development agreement, and the lack of a full evaluation and consideration of alternative project options including mining both sides of the canyon without cutting down any ridge lines. Add in the potential for two Brown Act violations by Azusa, including the fact the original vote to reconsider the project was originally not on the council agenda. Azusa (via Vulcan’s lawyers) will have to defend those allegations and its review of the project in court. How does this affect mining for now? Duarte can seek an injunction that would prevent operations until the legal challenges end. The court would have to approve any injunction. I hope everyone enjoyed their heat-wave filled weekends. In case you were out enjoying your life, here is your weekend roundup so you can get the news and be an informed member of society and all that. When it comes to taking money from groups pushing for new laws – and introducing their so-called sponsored bills – Assemblyman Ed Hernandez, D-West Covina, stands out. Three officers were severely injured when they were attacked with beer bottles while trying to break up a party Saturday, officials said. As for the future, the Montebello City Council will meet at 4:30 p.m. today to discuss releasing Interim City Administrator Randy Narramore from his contract and appointing an interim to take his place. And Azusa meets tonight with a second reading of the Vulcan Materials Co.’s Azusa Rock Quarry plan on tap. Like many others, I have lost some sleep because of the Azusa Rock Quarry mining proposal controversy in Azusa. My loss of sleep is more of the I had to work until the wee hours of the morning due to a late council meeting variety rather than the “soul searching” Mayor Joe Rocha was speaking of last night, but, nonetheless, it has been a long ride for everyone involved for a myriad of reasons. Anyway, despite the final decision being handed down last night giving approval to Vulcan’s plan to shift its operations to the west, everyone should already know – this fight is far from over. Duarte has contended for a long time that they would fight this in court. That decision will come soon. Then there is the potential referendum from Save Our Canyon. So, while everyone is feeling the hangover from last night’s/this morning’s decision, recover soon because there is more where that came from. A preview of tomorrow’s story. AZUSA – In a decision that many council members said would define their careers representing the city, a new Azusa Rock Quarry mining proposal passed 4-1 Wednesday morning. After nearly six hours of discussion ended just after midnight Wednesday, the Azusa council reversed an earlier decision and decided to allow mining to go west into Van Tassel Ridge in exchange for an overall better looking hillside, officials said. 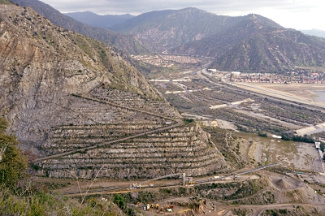 The proposal also takes mining further away from Azusa’s Mountain Cove community, spares Fish Ridge, adds millions of dollars in revenue to the city, and forces Vulcan to reshape previous mining benches into smaller benches the city hopes will improve an eyesore. Mayor Joe Rocha, the lone dissenting vote, said he was “heartbroken” by the decision to cut down Van Tassel Ridge. Duarte asks, like a good neighbor…will Azusa be there? In a detailed letter thrashing Azusa’s supposed new and improved Azusa Rock Quarry mining plan (facing the City Council tonight for round two) Duarte officials offered a mining plan of their own called the Good Neighbor Plan. Being that the major disadvantages to the plan is the reduction in mining, and as thus in profit for a major corporation, betting odds say Vulcan has as good a chance of accepting Duarte’s plans as there is Lebron goes to the Clippers. The council will ponder staff’s newly negotiated terms tonight at 7:30 p.m., as well as Duarte’s questions regarding the freshly inked amendments. The Azusa city staff report for Vulcan Materials Co.’s Azusa Rock Quarry mining plan was released late Thursday and includes a series of changes. The plan is up for reconsideration and a public hearing on the proposal is scheduled for Tuesday night. A story will follow this weekend, but check out the staff report for yourself. Expect a long meeting Tuesday following the long weekend. Have a safe and happy Independence Day. See some of you, I’m sure, at the council meeting Tuesday. If you plan on attending the Azusa City Council meeting Monday night post Lakers victory parade, bring a snack, some comfy shoes and drink plenty of water as it is shaping up to be a long night. On the agenda for Monday: the first step in reconsideration of Vulcan Materials Azusa Rock Quarry mining proposal, adoption of the 2010/2011 city budget, and a trash rate adjustment. If you live in Azusa, or Duarte for that matter, and have been too wrapped up in the NBA playoffs for the last few months, (full disclosure: I am a Lakers fan so today has been a very good day. On the other hand, Duarte City Manager Darrell George is a Celtics fan. Send your condolences to Duarte City Hall, 1600 Huntington Drive, Duarte) the mining proposal is the most controversial issue for Azusa in years and is a huge issue for many residents in Duarte who will also be affected. It was turned down a month ago by the Azusa City Council 3-2, but they recently voted unanimously to reconsider the issue. The meeting is sure to be filled with Duarte councilmembers, city staff and lawyers, Vulcan’s PR team and employees as well as many Azusa and Duarte citizens who will speak during the meeting’s public comment period. Azusa staff is expected to give a recommendation on how the city should proceed with the reconsideration process, including setting hearing dates, what issues should be further evaluated, and other aspects of the proposal the council would like to see renegotiated. The meeting is at 6:30 p.m. Monday at Azusa City Hall Auditorium, 213 E. Foothill Blvd.